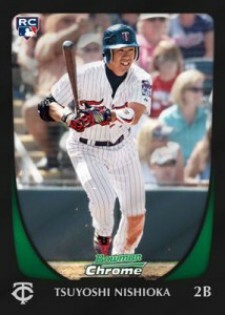 2011 Bowman Chrome Baseball continues to highlight some of the game's biggest prospects. As an added bonus, Topps is even throwing in a few veterans. This year's set continues the Bryce Harper hype, offering even more cards and autographs of the Nationals' star-in-waiting. Additional highlights includes a preliminary checklist of 38 on-card prospect autographs, multiple levels of Refractor parallels, redemption cards for 20-card USA Baseball 18U National Team Sets and Team USA autographs. All 110 players featured in the Prospects set were not in 2011 Bowman Baseball. One Bowman's Best Prospects card. Two 2001 Bowman Chrome Throwbacks. Two 2021 Bowman Chrome Futures. Autograph checklist includes Bryce Harper, Brett Lawrie, Matt Moore, Dustin Ackley, Eric Hosmer, Manny Banuelos and more. 110-card base set of veterans and rookies. 110-card prospects set (two cards per pack). Parallels: Refractors (1:4; Prospect Refractors /500), Blue Refractors (/150), Gold Refractors (/50), Orange Refractors (/25), Red Refractors (/5), Printing Plates, Super-Fractors (/1), Canary Diamond (/1). Printing Plates, Super-fractors and Canary Diamond cards are hobby-only. All Prospect Autographs are on-card. Parallels: Refractors, Blue Refractors (/150), Gold Refractors (/50), Orange Refractors (/25), Red (/5), Super-Fractors (/1, hobby exclusive). 20 USA Baseball 18U National Team Autographs will also be included. Parallels: Refractors, X-Fractors (/299), Blue Refractors (/99), Gold Refractors (/50), Orange Refractors (/25), Red Refractors (/5), Printing Plates, Super-Fractors (/1). 25 Bowman's Best Prospects cards put prospects on the 1994 Bowman's Best Baseball design. Parallels: Refractors (/99), X-Fractors (/25), Atomic (/1). Parallels are exclusive to hobby packs. Celebrating its tenth birthday, 2001 Bowman Chrome Throwbacks uses the design for 20 prospects and five veterans. Hobby-exclusive parallels: Refractors (/99), X-Fractors (/25), Atomic Refractors (/1). Topps jumps in their Delorian for 2021 Bowman Chrome Futures to predict what cards will look like in the future. Twenty-five prospects are featured. Parallels: Refractors (1:18), Future-Fractor (1:36), Future Fusion-Fractor (/99), Future Micro-Fractor (/25). Both the Fusion-Fractors and Micro-Fractors will only be found in hobby packs. Another three players sign for the cross-set Topps 60th Anniversary Autographs (/60). Each autograph has an inscribed birthday wish for Topps. USA Baseball 18U National Team Sets will be inserted as redemptions. Collectors who pull one will receive a 20-card set. Parallel sets: Refractors, X-Fractors (/299), Blue Refractors (/99), Gold Refractors (/50), Orange Refractors (/25), Red Refractors (/5), Printing Plates, Super-Fractors (/1). 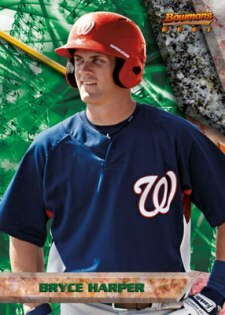 Good: Prospect card designs and 2001 Throwbacks are nice, chance of pulling a Matt Moore or one more of the ka-jillion Bryce Harper autographs add to the excitement. Bad: Bowman's Best inserts are boring, too much product reserved for veterans in a product that should focus on prospects, quality control issues with the return of the Bowman bends and fringing die-cut cards. The Bottom Line: For a product I enjoy every year, the “bads" outnumber the “goods." Hit seekers will probably be better served cherry picking the singles and autographs they want off the secondary market. The best thing about the product is the base prospect card design. It's sharp, shiny and has good art. It's very impressive. Also, the 2001 Throwback inserts are decent. Hopefully, these won't be ignored by the autograph chase. 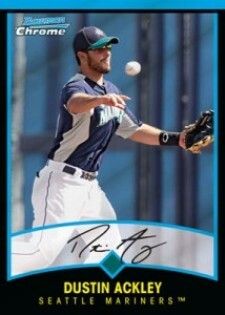 The autograph design provides a large signing surface, which make for great signed cards—when the players actually use them to their full potential. Unfortunately, while the design is good, the quality control is not. The dreaded Bowman bends have returned. Many cards from our box were so warped that only three corners of the card were able to touch the table surface. Even more disappointing are the die-cut cards. Each of the four in our box showed fringes peeling off the sides, wrecking what is an otherwise nice design. Unlike 2011 Bowman Baseball, which had a good number of intriguing pulls like Profar, Gordon, Goldschmidt, Hellickson, Harper and Gyorko, the Bowman Chrome checklist does not have much staying power. Matt Moore is the trendy pull. Even Dustin Ackley, Eric Hosmer, Brett Lawrie, Starling Marte or Jacob Turner are nice (although several of them are redemptions, sigh). 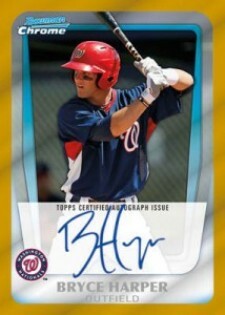 But everyone's hoping to pull a Bryce Harper, despite the fact that he's signed so much for Topps this year already. Other than that, there are not many other autographs worth chasing. eBay sales are reflecting this, with most autographs going for under $5.99. I guess the big names are being saved for Bowman Draft, which I'm really looking forward to. Also, too much of the non-autograph portion of the product is dedicated to veterans. Does anyone really care about the veteran cards from Bowman Chrome? Face it, lots of us are buying the hobby boxes for the autographs. And unless you pull a nice insert or a low-numbered Refractor, all the other cards are going into a shoebox in the closet. Given the large number of non-memorable autographs in this set, most likely you'll be disappointed with your pulls unless you buy by the case or luck out and make a really nice hit. Much of the excitement of busting a box of Bowman Chrome is finding the autograph. The chance of hitting a Moore, a Harper, or a low-numbered Refractor of anyone makes this release tons of fun. At least, that is until you bust the pack with the autograph and your pull is less than desirable. Then it all fizzles when you realize the money you could have saved buying the singles individually. I think it's time to reconsider the Bowman Chrome product configuration and make it more than one autograph per hobby box, especially when the chance of pulling a bad one ruins a lot of the goodwill from the rest of the box. Mike trout now drives this set, with Bryce and other prospects in a supportive role.